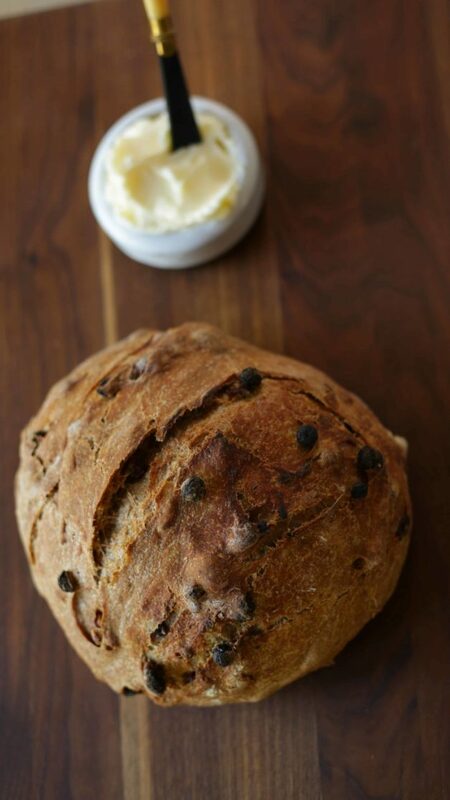 When winter’s chill is still in the air, there’s nothing more comforting than this No-Knead Cinnamon Raisin Bread. 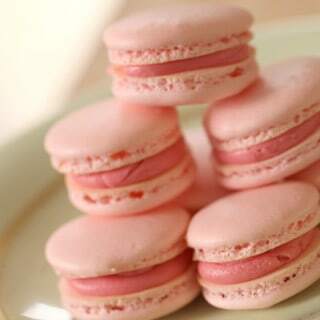 WATCH MY VIDEO DEMO OF THIS RECIPE BELOW! 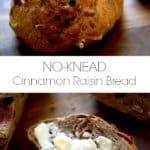 One of my favorites ways to make it is with a no-knead, slow rise technique that rises while you sleep! 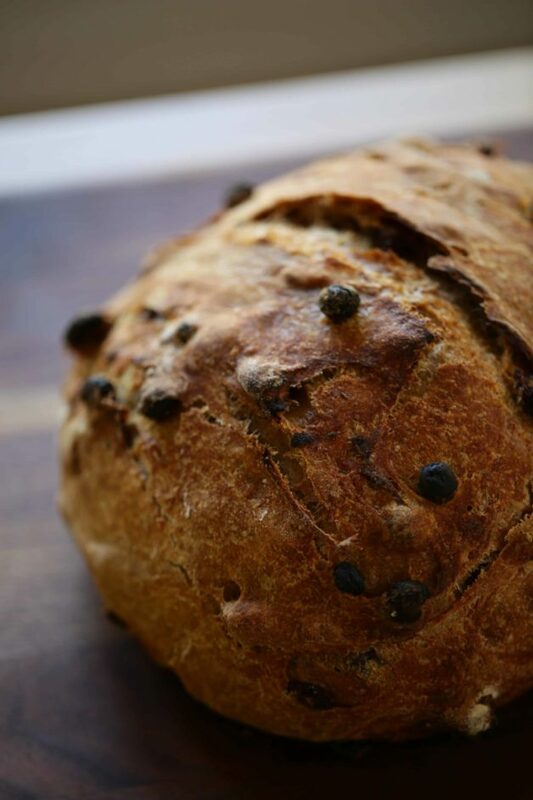 Wake up the next morning, punch down the dough and allow it to rise for another hour or so (I think 1 1/2 hours is perfect but you can get away with 1 hour if you are antsy) Then bake in a dutch oven and 30 mins later you will have the MOST delicious artisan bread! 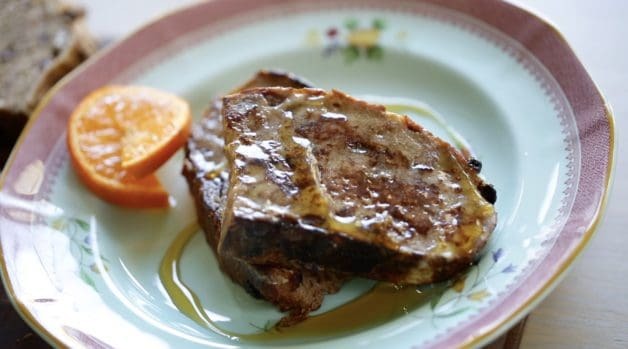 If you have any leftover, this bread also makes a terrific artisan French toast! 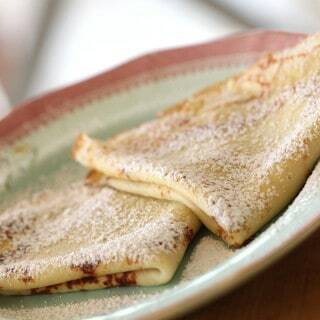 Drizzled with orange flavored syrup, it can’t be beat! Follow me us Youtube, Pinterest, Instagram, Facebook & Twitter! 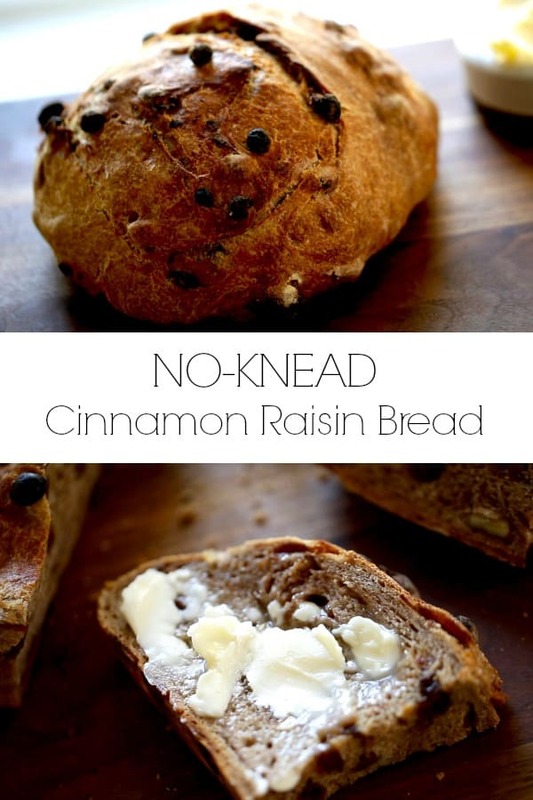 Artisan style no-knead cinnamon bread that rises while you sleep! Also makes from great French toast the next day. Whisk together the flours, yeast, salt, and cinnamon. Then add the walnuts and raisins. Stir to combine. Slowly add the water and stir with a wooden spoon until a dough forms. If the dough looks to dry add more water in 1 tbsp increments. Too wet add more flour in 1 tbsp increments. Transfer dough into a clean bowl that has been greased with olive oil. Cover with plastic wrap and rise over night. The following day, punch down dough and with “floured hands” form dough into a ball. Place in a clean bowl dusted with flour, cover with plastic wrap and allow to rise for 1 ½ hours. Pre-heat oven to 500F (260C) with the Dutch oven so both can get up to temperature together. Place dough inside and cover. Bake for 30 mins. 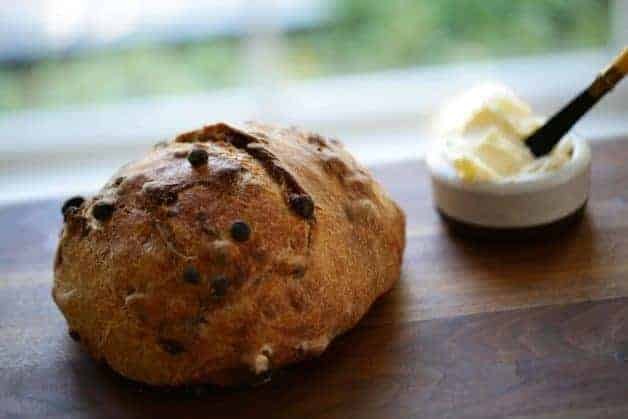 Allow bread to cool for 1 hour. Slice and serve! Bread also freezes well if sliced and placed in a plastic freezer bag. 1/4 tsp yeast for 3c flour? Really? 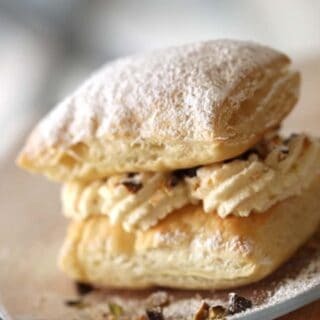 Just checking to make certain it isn’t a typo – recipe looks delish!! I added a little sugar tbsp at the most- cooking right now- can’t wait. 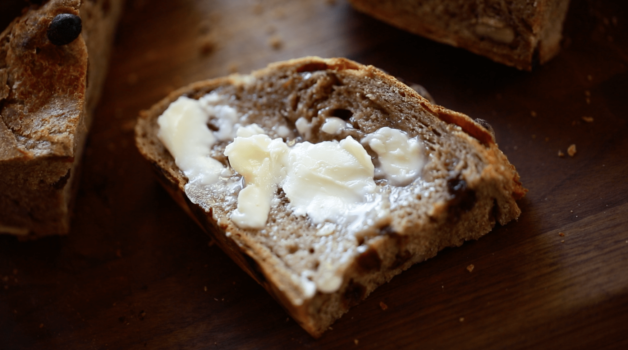 I made this with cranberries instead of raisins, but it still tasted delicious. I loved the crunchy crust! Do you put the dough in the Dutch oven as they come to temp tog or do you add the dough after both are at temperature? Great question! The dough should go in, once the oven and dutch oven are heated up to the right temperature. Hope you enjoy! 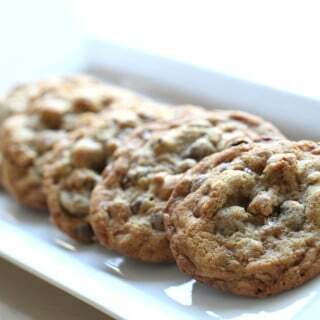 Could I use all whole wheat flour instead of half? Oh sure I’ve done it that way too. 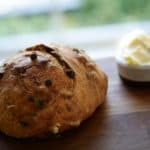 Creates a denser bread that is also great! These recipes sound so wonderful! I can’t wait to try them. Especially the bread. Need to get whole wheat flour. I don’t have a Dutch oven pot. Can it be baked in a regular bread pan or mini pans with open tops? Sure you could try that too, bread pan or loaf pan. Or really just on a baking sheet would work too. Hope you enjoy! baked it yesterday and turned out so good. YAY! So glad it was a hit! And so much easier than you think right? Ha!